Fillet the chicken breasts, salt and pepper to taste, and cook on the grill or in a grill pan for approximately 5 minutes on each side. While the chicken is cooking, slice the tomatoes and olives and set aside. In a medium-sized frying pan, add 1 tablespoon of olive oil and sauté the chopped spinach. Drain the can of anchovies and separate the individual fillets. Crush the clove of garlic and add 1/4 cup of olive oil, mix well. Slice open the loaf of French bread lengthwise, and brush both sides of the roll with the oil and crushed garlic mix, preferably using a silicone pastry brush. Once the chicken fillets are ready, arrange on the bread, top with the sautéed spinach, a row of sliced tomatoes, the individual anchovy fillets and sliced black olives. Season with freshly ground black pepper, to taste. ¡Buen provecho! When working with raw poultry, whenever possible use gloves and thoroughly disinfect all surfaces where chicken was prepared. If you don’t plan on serving the sandwiches right away, wrap them in aluminum foil. Enjoy fresh, versus leftover, for the best flavor. One day, at the dinner table, my husband turned to me to say: “I could eat chicken every day.” What he really meant was that any recipe with chicken is a good recipe in his book. After hearing this, I was determined to impress and spoil him with my favorite dishes with chicken as the main ingredient. Since I do more elaborate cooking on the weekends, during the week I try to stick with fast, wholesome recipes whenever possible. My hubby especially loves chicken breasts, French bread, spinach and tomatoes. 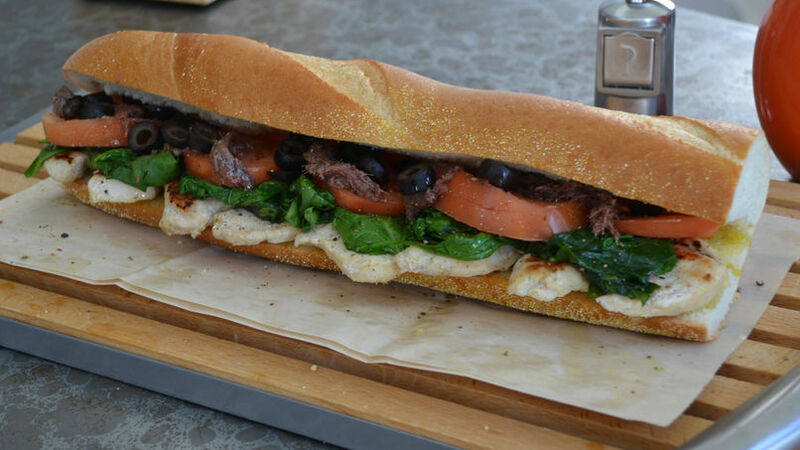 So I came up with a way to bring together these four nourishing ingredients, creating this grilled chicken and spinach baguette.” A riquísimo sandwich, just looking at it makes my mouth water. The best part? It only took 20 minutes to put together! Our schedules are packed and our daily to-do lists, long. This easy recipe uses a few simple ingredients so that you can whip up a light and nutritious lunch, snack or dinner in a matter of minutes. Enjoy!